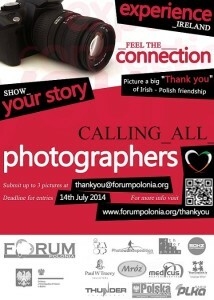 Forum Polonia is calling all photographers living in Ireland. On the 1st May 2004 Poland joined the European Union. Since then thousands of Poles have come to Ireland and found their home here. In 2014 we celebrate 10 years of Polish membership in the EU. Forum Polonia would like to take this opportunity to organize a photo competition “Thank you Ireland”. There are 122,585 Polish in Ireland, and each of us have our own story and reasons to say “Thank you” to Ireland and our Irish neighbours (for the warm welcome, for fulfilling our ambitions, for finding love, for job opportunities, and thousands more). Our Irish friends would surely have reasons to thank us for being here too. We are inviting you to submit photographs showing a ‘’Thank you’’ of Irish – Polish friendship. The best twenty photographs along with a small description will be displayed in an exhibition in Dublin. The Jury will also award four main prices, which will be given to the author’s of the winning photographs. Please include in your email a brief description explaining how the image portray the subject of the competition. Deadline for entries is 14th July 2014. The rules of the photo competition can be found below. The photo competition is supported by The Embassy of Republic of Poland. The administrator of this competition is Forum Polonia. – a celebration of the 10th anniversary of Poland’s entery to the European Union. The competition is directed towards all amateur or professional photographers living in Ireland. Participants must be a legal age before or on 14th July 2014. The competition takes place from the 1st of May until 14th of July. Works delivered after the deadline will not be considered in the competition. An author’s photograph is the object of the competition. The images should express stories which illustrate what Polish people can be grateful for to Ireland and the Irish nation, and also what they would like to thank them for (eg. For their hospitality, for their work, for the possibility to fulfill oneself, for the love some found here), or the stories of the Irish citizens, who are grateful that Polish people live in Ireland. The photographs should belong to one person only, and they should be accomplished by the participent of the competition without the help of any other parties. Maximum of 3 works are permitted per candidate. The photographes of size up to 8MB should be sent through email to: thankyou@forumpolonia.org or through Dropbox or GoogleDrive. Works should be in the JPG format (without compression) or TIPP in the minimal dimensions of 3266 x 2450 pikseli. The administrator of the competition claims the rights to refuse any works that do not meet the above criteria. The participant, by entering the competition declares that he holds full rights to the photographs he enters. Furthermore he declares his permission for multiple, free of charge publication of the work, name and surname in the promotions associated with the competition, the publishing house and the internet websites of ForumPolonia. Lastly, the participant allows for the use of his works for promotional and marketing purposes. Entering of the works will be treated as an acceptance of the stated Rules. The participation in the competition acts as an acceptance for the processing of the author’s personal details by the Competition Administrator. A Jury will be appointed to rate all the entered images. The Jury will choose works which will be showed at the post-competition gallery exhibition, and will allocate three main prices, which will be given to the author’s of the winning photographs on the opening day of the gallery exhibition. The results of the competition will take place on the 30th of Septemeber 2014 at the latest. Responsibility for any violation of third party rights of the works entered will be fully applied in all cases. The Competition Administrator reserves the right to use the entered works in publications of all sort and/or in any promotional actions (this also applies to the works which have not been nominated for an award). No reward will be given to the participants of the competition for the use of their work by the Administrator. This is agreed upon the participant’s entry in the competiotion. The Administrator of the competition reserves full rights to change any provisions of the above-stated Rules. In the case of any not regulated matters, the Jury will be the main decision making body.